Bulgaria's Grigor Dimitrov reached his first ATP World Tour semi-final with victory over ninth seed Kevin Anderson in the Aegon Championships at Queen's. The 21-year-old beat 6ft 8ins Anderson 4-6 6-4 6-3 to book a meeting with Argentine David Nalbandian. 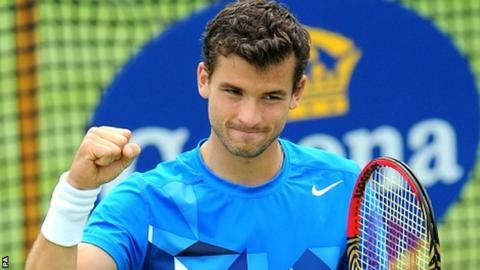 "I can't hide my tears," Dimitrov told BBC Sport. "I'm more than thrilled today. Hopefully I will play better tomorrow. I'm looking forward to it." Third seed Janko Tipsarevic suffered a shock defeat by Yen-Hsun Lu. There aren't many players out there who you look at and think, 'He can make something out of nothing," but with Dimitrov you do. Most players wouldn't have the imagination to try some short - Dimitrov tries them and makes them. At this level in the men's game having talent is good, but if you're not as tough as nails you'll be eaten alive. Dimitrov is tough, and this run will give him encouragement. He's into the semi-finals and there's no reason why he can't go further. Lu came back on court later to play sixth seed Marin Cilic in the last eight but retired while trailing 6-4 2-0. Next up for Cilic is American Sam Querrey, who beat Croatian Ivan Dodig 7-5 3-6 6-3. "In the first week, grass surfaces can be a bit dangerous," said Cilic. "Yen pulled a muscle and was not able to continue. "I hit some balls, felt good and served well. I was playing well on clay, and feel good of the grass. I'm feeling confident I can play anyone." Cilic could meet Dimitrov in the final after the 2008 Wimbledon junior champion's victory over big-serving Anderson of South Africa. Queen's tournament director Chris Kermode chose Dimitrov ahead of British players for wildcards in 2009 and 2010, and the talented right-hander promised to repay that faith. But he won only one match on each of those appearances and when he qualified by right last year, he fell in the first round. This time, however, he has beaten Gilles Muller, Nicolas Mahut - who shocked Andy Murray - and now Anderson. "I came here wanting to win the tournament," Dimitrov added. "I wanted to play well, get a couple of matches before Wimbledon and today was one of those days when you give it your all. "It was a tough day for both of us with the rain delays and I'm very happy I could get out of this match." Dimitrov - nicknamed 'Baby Fed' because of a resemblance to Roger Federer in his play - may be confident of reaching the final in the absence of so many big names. With Murray, Gilles Simon and Feliciano Lopez already out, Tipsarevic's defeat meant the top five sees had all fallen before the semi-finals. In the doubles, Bob and Mike Bryan beat British sixth seeds Colin Fleming and Ross Hutchins 6-3 6-3 to reach the semi-finals. Top seeds Max Mirnyi and Daniel Nestor saw off Lleyton Hewitt and Andy Roddick 7-2 7-5.